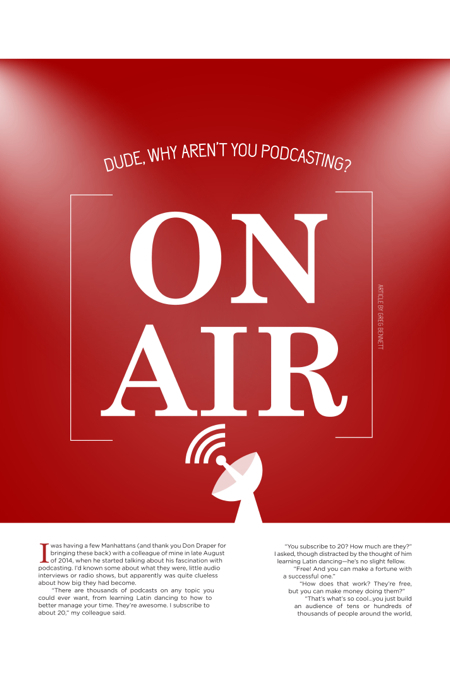 Hilton Head Magazines: CH2/CB2: Dude, Why Aren’t You Podcasting? I was having a few Manhattans (and thank you Don Draper for bringing these back) with a colleague of mine in late August of 2014, when he started talking about his fascination with podcasting. I’d known some about what they were, little audio interviews or radio shows, but apparently was quite clueless about how big they had become. “There are thousands of podcasts on any topic you could ever want, from learning Latin dancing to how to better manage your time. They’re awesome. I subscribe to about 20,” my colleague said. “You subscribe to 20? How much are they?” I asked, though distracted by the thought of him learning Latin dancing—he’s no slight fellow. “Hmmm, sounds like you have no clue what you’re talking about,” I joked, though a bit intrigued. “A podcast on podcasting, from an entrepreneur who interviews entrepreneurs. I see a pattern here. And how do you know he makes that much?” I asked, now frantically signaling for a Draper refill. It could have been the drinks, but the more he talked, the more podcasting seemed like an interesting idea. He said the reason podcasts blew up a few years ago was because of the explosion of hand-held devices, like your phone, and iPods, and tablets. Made sense. “Yeah, yeah, $30,000 a month,” I chuckled and chomped down on a well-soaked black cherry. Well, if there’s one thing I do have its content. Tons of tons of tips and ideas and strategies I’ve collected over 25 plus years as a sales trainer, coach, consultant, and writer, all just sitting in computers and filing cabinets, or buried deep within Power Point decks. Another sip. A squint-eyed stare. And not exactly simultaneous, but close. Five months later, we launch the podcast! My colleague Ken became my business partner shortly after that fateful meeting, and we spent the next five months creating a new business and launching our podcast, “The Daily Drive with Greg Bennett” (you can subscribe to it on iTunes or Stitcher). Our goal was to create a new website, GregBennettSales.com, and a podcast for salespeople—like a daily booster shot of encouragement, belief, motivation, and sales tips. Greg Bennett is a nationally renowned sales and business author, speaker, trainer, and coach. For information on his programs visit GregBennettSales.com; subscribe to his podcast “The Daily Drive with Greg Bennett”. Find it on iTunes or Stitcher. • Pick a topic. Your podcast could be about any area of personal or professional interest. The more passionate you are about the topic, the more interesting the podcast will be. • Decide on a production style. You’ll need to decide the type of podcast you want to do: an interview format, just you talking, two or more people talking, etc. • Determine how often you’ll produce the podcast. Committing to a daily podcast, as we have done, takes a great deal of time and energy. You might start with a weekly or even monthly production to get started. • Select the level of recording quality you’ll need. You can record an MP3 audio segment by simply using your laptop microphone, or upgrade and use a professional recording studio. You can even find background music and sound effects online if you want to dress up the recording. • Explore recording and mixing options. The best online recording software is Audacity. You can download it free, and it’s super easy to use for mixing two or three voices, along with sound effects and music. • Promote your podcast on iTunes or Stitcher. Getting your podcast hosted on iTunes or Stitcher (for non-apple products) doesn’t cost anything, but you’ll need to go through the submission process, which includes certain steps and protocols that will take a few weeks. • Monetize your podcast. It will take a while to get your podcast and website into a position to make money. You’ll need several thousand listeners and subscribers before you can offer advertisers something of value. An initial strategy may be to offer a VIP, or backstage pass, for a nominal fee and then provide these people with extra value or additional services.